Nokia is one of the most trusted named in the field of gadgets and handsets. It has been releasing so many new mobile phones this year with an agenda to reach out to a wider section of the customers and to expand and diversify its portfolio. The company is well known for launching quality devices with excellent technology embedded in them. Built: The dimensions of the Nokia 106 handset are 112.9 x 47.5 x 14.9 mm and it weighs about 74.2 grams. Display: This handset comes with a QQVGA TFT display of 1.8 inches that offers a resolution of 160 x 128 pixels and supports 65,000 colors. Software: The Nokia 106 functions on Series 30 platform. Connectivity Features: The connectivity features include a 3.5 mm AV connector and a 2 mm charger connector. Other Features: Nokia 106 features FM Radio, multiple alarm clock capabilities, native games, speaking clock, flashlight,4way Navi Key and 32 polyphonic ringtones among other features. Its keypad is splash and dust resistant. This handset will be available in white, black and red color variants. Battery: This device works on a battery of 800 mAh which is sufficient enough to deliver a standby time of 35 days and talk time of about 9.9 hours. Our Take: The Nokia 106 is one of the most reasonably priced feature handset that offers nice specifications. 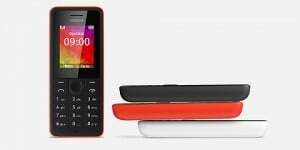 Though quite similar to 105 in features, unlike it, Nokia 106 is a single SIM device and carries a slightly larger display.